This Szechuan Smoked Duck recipe is from my book Paul Kirk’s Championship Barbecue, which was first published in 2004 and is currently in its 18th printing. I also like to serve a Raspberry Habanero BBQ sauce alongside this duck recipe. That bbq sauce recipe is not in my cookbook, but I have included it below. Enjoy! Rinse the duck inside and out under cold running water, removing the giblets and neck. Pat dry with paper towels. Rub the duck inside and out with the sesame oil, then season evenly with the Szechuan Rub inside and out to taste; remember this dish is spicy. Prepare an indirect fire. Place the duck on the pit breast side down, cover and cook at 230º to 250º degrees F for 2 hours. 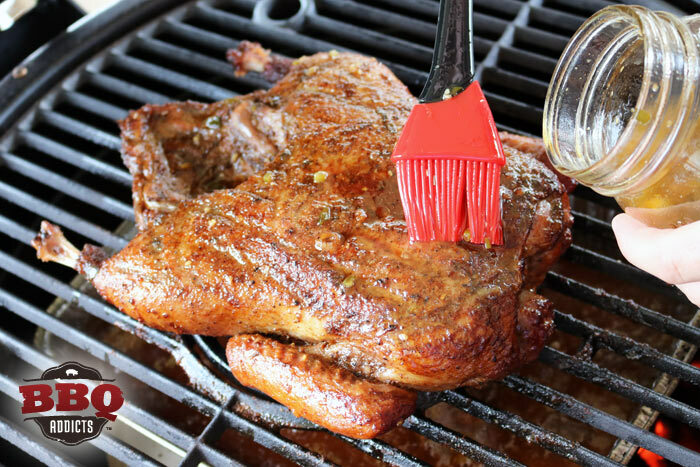 Turn and baste the duck with the Picante Beer Marinade. Continue to cook, basting every 30 minutes, until an instant read thermometer inserted into the breast and thigh, away from the bone, registers 165º degrees F (about 4 hours total). Let rest for 15 minutes before carving. Serves 4 to 6. To make the rub combine all of the ingredients in a small bowl and blend well. Heat a small heavy dry skillet over medium heat until it is hot. Add the salt, peppercorn and 5 spice powder and dry-roast the mixture, stirring and shaking constantly, until the mixture turns very dark, but don’t let it burn! Pour the mixture into a small bowl to keep it from darkening even more in the still-hot pan. Remove and discard the peppercorns. Store the seasoned salt in an airtight container in a cool dark place for up to a year. Makes about 1/4 cup. Combine all of the ingredients in a medium-sized nonreactive bowl and blend well. Makes about 2 1/2 cups. Combine all of the ingredients in a small sauce pan over medium heat. Sounds like an awesome way to prepare duck! I’ll have to give this a shot next time I’ve got my hands on some. Thanks for sharing! A little bit involved but it sounds absolutely worth it. I’ve got the book but have never made this one. I’ll be changing that. Chris – I cooked this recipe today so we could get some photos for the post. You are correct, it’s a very involved process. Very rewarding though! It was a fun cook with flavors I’m not used to playing with. I was expecting it to be HOT based on Paul’s description, but instead I found it pleasantly warm. I’ll probably amp up some of the peppers next time to get more of a burn. The flavors would also work well on chicken wings for a shortcut version of the recipe! these look delicious! exactly the kind of recipes i was looking for! thanks for the share! Looking forward to trying this recipe when I have some time! Looks great, love a good smoked duck. I used to buy crispy duck all the time and then started doing them on the Weber a few years back, always willing to try a new recipe.